Historic documents about our families can be read here - most have been transcribed over the years but, so far as I can tell, the texts here are essentially as originally written. More are needed for inclusion! 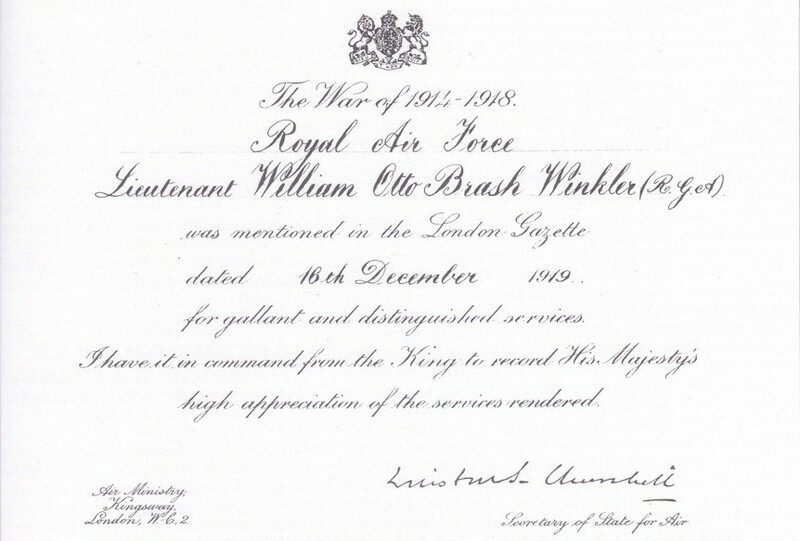 Royal Flying Corps experience of Willam Winkler in World War I and his "Mention in Dispatches"
Letter from Fritz Muller recording family genealogy back 4 generations and giving details of the life of Carl Gottfried Muller, of his brothers Otto and Carl, and of Christian Charles Godfried Russ and his wife Emily. The letter was presumably sent to his nephew Carl Godfrey Muller in Brandon, Canada; it was certainly transcribed by C G Muller in April 1951. Autobiographical notes, written in October 1973 by Carl Godfrey Muller [born 1873 son of Otto & Emily Muller], describing family life in Brandon, from the time of their arrival through both World Wars and on to the 1950's. Apprenticeship Deed as a cabinet maker for Percy Russ in 1895.